Be the first to hear about their new releases and deals. Download the Booksprout app and search for Lisa Manifold today! She is a fan of all things Con, and has an entire room devoted to the costumes created for Cons. She served on the board of Rocky Mountain Fiction Writers in various positions and in 2016, was named the 2016-2017 RMFW Independent Writer of the Year. 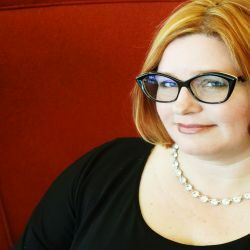 Lisa is the author of the fae paranormal romance series The Realm, the Grimm fairy tale retelling Sisters of the Curse series, the Djinn Everlasting series which follows a free-lance djinn, the Aumahnee Prophecy urban fantasy series, and the urban fantasy series The Dragon Thief.